Trends across most print outlets point to a shift toward online and the importance of maintaining community news coverage, even while trying to increase coverage of the Middle East and North Africa. And for the most part, Arab-American newspapers are offering both Arabic and English content to their changing readership. In general, Arab-American newspapers are suffering from a significant drop in advertising revenue, which is a major source of funding for the papers. Most are free if picked up at a newsstand or store, though there is usually a fee attached to having a newspaper home delivered. Subscriptions range from $20-to-$30 annually for quarterly papers, to $75-to-$150 for some weeklies. As more young Arab Americans do not read Arabic, an increasing number of outlets are also publishing in English, according to Manneh. Whether an Arab-American paper remains entirely in Arabic or incorporates English depends in part on the market. "It would behoove the media outlets to at least have some kind of English [content], and I think a lot of people are slowly catching on to that," said Manneh. That trend, she noted, affects other bilingual media as well. One of the more established Arab-American newspapers still in print is The Arab American News, started in 1984 by publisher Osama Siblani. Published in both Arabic and English on a weekly basis, it focuses on bringing together a diverse Arab-American community in the Dearborn/Detroit area. Circulation of the paper in 2012 was 35,000, up almost 17% from 30,000 in 2009, according to Siblani. The vast majority of those readers, about 90%, reside in Michigan. Siblani said that in the past he tried to broaden distribution to markets outside of Michigan, but the cost of large-scale expansion proved too expensive. Siblani also believes that despite a growing demand for the paper, The Arab American News’ circulation is not as high as it could be because of budgetary constraints. Advertising revenue has fluctuated over the past few years, and while the paper continues to recover, faring better than in 2010 and 2011, figures for 2012 are still down about 25% to 30% from what they were before the economic crisis. Print readership is higher than digital, but The Arab American News is also trying to expand the paper’s online presence. Its website has averaged about 10,000-15,000 visitors per week so far in 2012, and Siblani said he expects those figures to continue to grow. Arab-American readership is changing and younger generations are becoming more involved. "The paper has to either… stay with them or they’re going to… leave us… and go somewhere else," Siblani said. 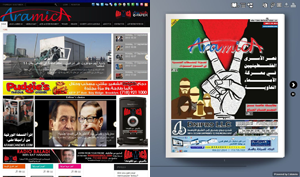 Arab American News also offers an e-newspaper (or e-edition)–an electronic publication identical in content and layout to the print version. E-editions tend to be found within the outlet’s main website, usually in PDF or Flash format. For locally-based outlets there are certain advantages to an e-edition. "People can see the [same] advertisements and the articles [that are in] the newspaper," according to Fatmeh Atieh Bakhit, publisher and editor-in-chief of the Los Angeles-based paper Al Enteshar al Arabi. Community news is a growing part of The Arab American News’ original content, which makes the paper stand out from outlets that are increasing international coverage. Siblani explained that the high cost of sending reporters into the field is making it difficult for the paper to keep up with mainstream media coverage of national and international events. Additionally, Siblani reasons, if Arab-American media are to offer something their audiences cannot get elsewhere, it is in community news and information. Still, the paper does contain some original reporting from abroad. Despite cuts in revenue, the newspaper has three part-time international correspondents stationed in the Middle East, in addition to its Michigan-based staff. 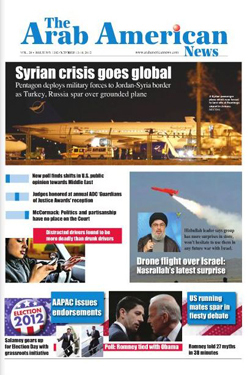 The paper aims to provide coverage of events in Arab countries from an Arab-American perspective. The Arab American News relies on outside sources such as International Press Agency for some of its international coverage, and also includes analyses from various experts, ranging from academics to former intelligence officials. Aramica’s circulation is around 35,000, according to Faisal, which is up approximately 9% from 2009. The increase in circulation, however, has not been accompanied by a rise in advertising revenue. Faisal puts revenue for Aramica at around a third of what it was before 2009. He also said the paper continues to run on a minimal budget, unable to send reporters to cover as many events as it once did. The newspaper’s website, which includes access to an e-edition, is growing. Aramica.com saw a sharp increase in visitors over the past six to seven years. In 2005, Faisal said there were only about 1,400 unique visitors per month; by 2011 there were 350,000. 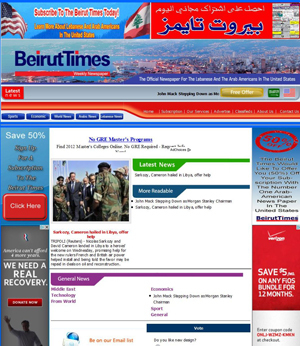 The Beirut Times, one of the six weekly Arab-American newspapers, was started in 1985 and is based in Pasadena, Calif. It, too, has suffered from losses in advertising revenue since 2009. Managing editor Samuel Mansour said that businesses serving his audience are struggling since the recession. But he also suggested that the Arab uprisings have a lot to do with this drop in advertising. "The situation in the Middle East, especially Syria… it’s affecting [community members’] families, their land… so their businesses [are] going down and they’re not spending [on advertising] anymore." He said this loss in revenue has also hurt the paper’s circulation because they can’t print as many copies. It was at 32,000 in 2009 and has since dropped almost 16% to 27,000. Mansour and his staff remain heavily focused on the print edition, which they see as unique from all of the information available online. But they also recognize that increasingly "many people like to see something on the internet." So even with diminished resources, the paper has updated its website and now offers English content in addition to Arabic. Mansour said that The Beirut Times "cannot be behind" technologically, citing the recent closure of smaller papers. One Arab-American newspaper that prints most of its content in Arabic is Al Enteshar al Arabi. Started in 1999 by publisher and editor-in-chief Fatmeh Atieh Bakhit, Al Enteshar is published two to three times a month, with a circulation of about 200,000. In addition to its staff in Los Angeles, Al Enteshar works with freelance reporters based in the West Bank, Jordan, Egypt, and London who send reports in Arabic back to Los Angeles about once a month. Al Enteshar‘s circulation has remained relatively stable in the past few years , according to Atieh Bakhit, though advertising revenue has decreased by approximately 25%. Atieh Bakhit also cites struggling local business as a main reason for the decline. During certain times of the year, such as the month of Ramadan, ad revenue increases enough to publish the paper more than twice month. The paper is comprised of international political news, entertainment, economic news, community events, and some religious content, with a significant portion devoted to international events since the onset of the Arab uprisings. Typically Al Enteshar publishes at least one full page in English per issue, though this has decreased recently. "In the last two months… [there were] three or four articles in the newspaper in English," Atieh Bakhit said. While the majority of Al Enteshar will remain in Arabic, the newspaper plans to print more English content in the near future. According to Atieh Bakhit, there are several reasons that the Al Enteshar is mainly in Arabic. First, a large part of the readership tends to prefer it. She states that "most leaders from the community, they feel… comfortable when they read [the paper] in Arabic." Al Enteshar also has readers in the Middle East and North Africa who do not necessarily read English. The surge in news coming out of Arab countries following the uprisings has also played a part in the paper choosing to print primarily in Arabic. Much of the best reporting comes from reporters based there, who write in Arabic, according to Atieh Bakhit. It can be difficult to translate the more nuanced aspects of some Arabic stories into English. The majority of Al Enteshar’s readers are in California, but their e-newspaper reaches a broader audience across the United States. The paper does not have a full website. Atieh Bakhit said the e-edition works well and that it would cost too much money and time to create a separate website. "Overview of Arab American Media in the United States." National Arab American Journalists Association. 2009. 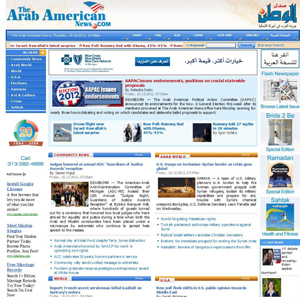 The Arab American News website. 2007. Re-posted on Arab Journalism. Atieh Bakhit, Fatmeh. Interview with PEJ. Sept. 24, 2012.